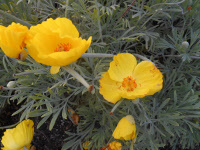 Non-stop, very showy, bright yellow crepe-papery petals encircle orange stamens, poppy-like blooms, above dissected blue-green foliage. Without doubt, our favorite annual. Native: highlands in Chihuahua Desert from northern Mexico into southern Arizona and Texas. Described in The British Flower Garden 3: 54, pl. 276. 1828. Pendulous Granny Smith apple colored, tube-shaped flowers in summer through fall. Pendulous Granny Smith apple colored, tube-shaped flowers, summer through fall. Nicotiana langsdorfii introduced in 1819. 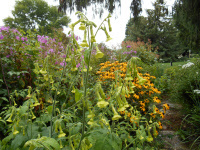 The genus name nicotiana named after John Nicot who introduced smoking tobacco to Europe. Langsdorfii named to honor Russian naturalist Georg Heinrich von Langsdorff, Baron de Langsdorff ( 1774 -1852), Russian consul general in Brazil and leader of Langsdorff Expedition of Brazil, 1826-1829. 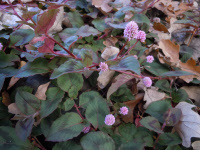 Oval-shaped spikes of pink flower heads June through October, with ornamental, chevron-like pattern on the leaves. Wonderful groundcover, good for rock gardens and containers and between stepping stones and anyplace you want to put a plant.